Wendy Francis is the author of the novels The Summer Sail, The Summer of Good Intentions, and Three Good Things. She is a former book editor whose work has appeared in the Good Housekeeping, The Washington Post, Yahoo Parenting, The Huffington Post and Congnoscenti. She lives outside of Boston with her husband and son. 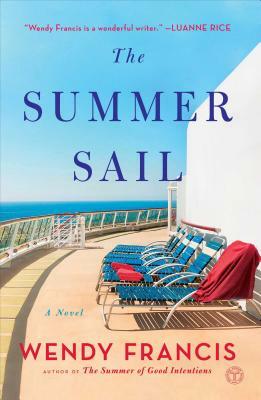 "Every reader longs for the kind of female friendships Francis has created in The Summer Sail. Her words whisk us off to sunny skies and sandy beaches, but when the holiday ends, we are left with more to think about than when we began. Hope and heart fill these fast-turning pages." "The setting of this enjoyable novel is enticing, and the tone is breezy. A sure bet for your summer beach-reads list. Recommend this one to fans of Elin Hilderbrand and Anne Rivers Siddons." "10 Novels to Gift Mom This Mother's Day." "A wonderful book about friends and sisterhood." "A very fast read that had me reminiscing about my own forever friends." "Everything a good beach read should be. . . light, witty, juicy, and with the right touch of mystery. Chock full of details that help the reader slip away. . . on the cruise to Bermuda." "A fantastic escapist read in every sense with a fabulous setting, smooth writing, likable characters and dilemmas that just about anyone could relate to." "A lovely summer read. Wendy Francis deftly explores the bonds of sisterhood and the complexity of family relationships." "Wendy Francis has created both a family and a story I did not want to leave. These three sisters on a summer vacation display the strong ties that can both hurt and heal a family. Filled with the sweet briny air of Cape Cod, this extraordinary tale shows that, together, we can weather all the seasons of life." "An especially memorable, enjoyable read about family ties and the highs and lows of relationships between couples." "You are headed to Cape Cod even if you don't leave your front porch. . . . Watch as the family drama unfolds with lots of laughter, heartache, and healing." "Wendy Francis brings the seaside retreat vibrantly to life and the idyllic setting perfectly balances the characters' weightier issues. The characters are brilliantly developed. . . . A warm and inviting story with a close-knit family whose love is strengthened by crisis." "Francis weaves a tale of love, loss and repair, offering comforting themes and lessons about avoiding the mistakes of our parents." "A fantastic family story, with the relationship among the three sisters particularly strong and relatable. They face a family crisis with their aging father and it is a heartrending novel."